Construction Executive's 12th Annual Contractors' Guide to Surety Bonding included valuable input from Merchants associates. Vice President of Contract Underwriting Josh Penwell provided an Executive Insight discussing how surety professionals provide market intelligence to contractor and subcontract clients (page 58). Keenan Lehmann, Assistant Vice President of Merchants' Austin, Texas office, explained why underwriting is so complicated and thorough in his Special Section article, which outlines the underwriting process and the differences between surety bonds and traditional insurance policies (pages 78-79). 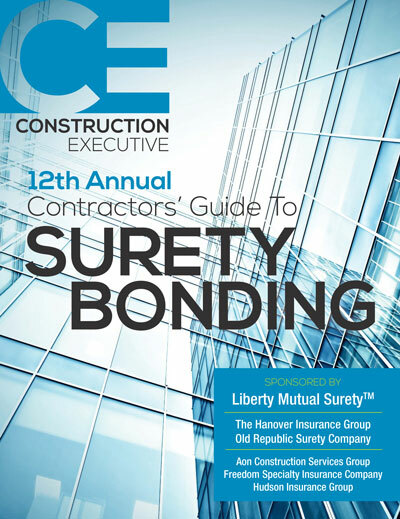 Click here to read Construction Executive Contractors' Guide to Surety Bonding.